Kempinski Hotel Grand Arena Bansko is the proud winner of the TripAdvisor Travelers’ Choice® Awards for Hotels in Bulgaria for 2019. The hotel ranks first among the “Top 25 Hotels”, “Top 25 Luxury Hotels” and “Top 25 Hotels for Service”. Travelers’ Choice award winners were determined based on the millions of reviews and opinions collected in a single year from TripAdvisor travellers worldwide. “The hotel won the TripAdvisor Travelers’ Choice Award for the seventh consecutive year, which is an outstanding achievement and a great incentive to continue to provide impeccable service and remarkable experiences to our guests,” General Manager Natalia Kashirskaya commented. “This accolade is indeed a great start to the year and the highest honour a hotel can receive from the TripAdvisor community as the result is based on the reviews and opinions of millions of travellers. On behalf of the entire team, I would like to thank our guests for their devotion, and we are looking forward to welcoming them again soon,” added Ms. Kashirskaya. For the complete list of Travelers’ Choice award-winning hotels for 2019 across all categories, including the top hotels around the world, visit: www.TripAdvisor.com/TravelersChoice-Hotels. Being the only ski-in and ski-out hotel in the area, Kempinski Hotel Grand Arena Bansko is located in the very heart of the most popular and vibrant winter resort in the Balkans – Bansko, right across from the Gondola lift station that gives access to 75 km of ski runs groomed at high international level, suitable for all skiers from complete beginners to advanced ones. 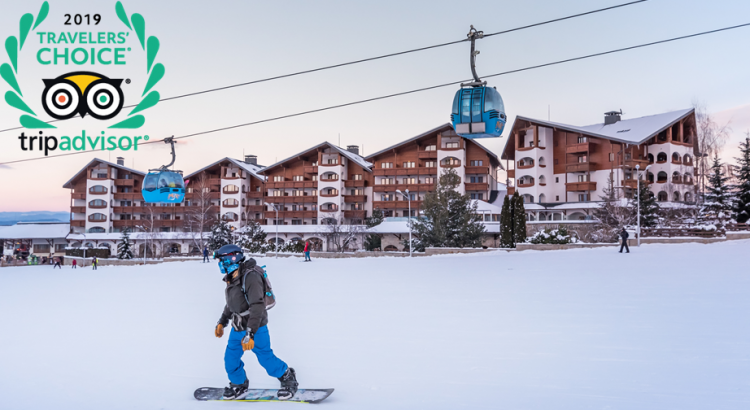 The luxury hotel is the only international branded winter resort in this part of the Balkans and is open year-round. It features 157 Alpine-style rooms, including 25 suites and an exclusive Presidential Suite, fully renovated Kempinski The Spa with brand-new and unique thermal facilities, four conference rooms and eight restaurants and bars with spectacular views of the majestic Pirin Mountains. Graced with European flair, the hotel grants the ultimate Kempinski ski, gourmet and SPA experience.